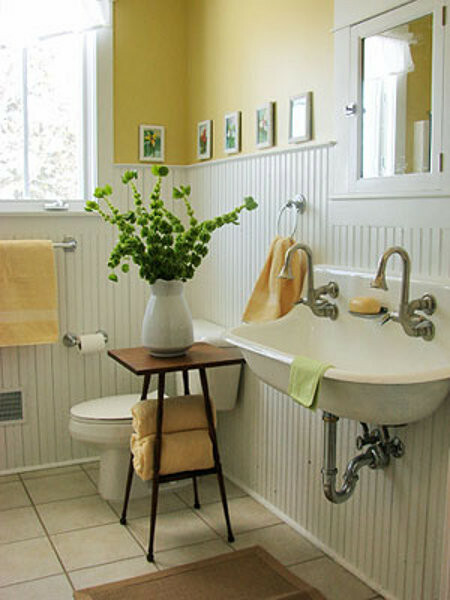 The cheerful mimosa-yellow cottage color sets the tone for this bath. Then there’s thewall-mounted, retro double-basin Kohler Brockway sink with twin Cannock faucets. This sink comes in 3-foot, 4-foot and 5-foot lengths. Classed as a utility sink it is terrific for bathrooms and it can cut across many styles as our Rustic Basin Sinks post shows. As a sink installed on the wall, the Brockway will have exposed plumbing below unless it’s sent in a vanity. Photos of the Brockway show different colors on the bottom, an added bonus. Here, it fits in well with the cottage bathroom aesthetic. The neutral floor tile doesn’t interfere though it lacks personality. Adding a typical Victorian side table is an appealing decorative touch. I would really love to know where I could find a sink like this! Gretchen, try searching for vintage porcelain utility or kitchen sinks online. Any local salvage yards. Online: This Old Tub and Sink, Historic House Parts, and Olde Good Things are just a few sources. Good luck! Would like to know the brand and paint color for the yellow walls. I’d look at Benjamin Moore “Sunporch” or “Yellow Rain Coat.” Should be very close. This is a very random question, but does anyone know what like of flower is in the vase? Looks like Bells of Ireland.